Kes Consulting Group provides Web Design & Development and Search Engine Optimization services in the Jacksonville, FL area. Kes Consulting Group has started a new venture on Amelia Island. Amelia Web Works is now open to help the web development & design and SEO needs of the Fernandina area community. We plan on keeping KCG open to our clients across the country but Amelia Web Works will be deeply involved in the Amelia Island community, as that is where we plan on growing roots for the long-term. We’re looking forward to many more years of success. It’s been an interesting time for search marketers, with lot of early research indicating various different trends and anomalies for the new look SERP. The major worry is that paid search advertising will become more competitive and that organic results are getting pushed further and further down the page. Although one of the surprising developments is that having your ad appear in position 4 may lead to as high CTR as position 1. Today’s research however highlights the need for paid search teams to align their strategies with customer intent. Searches indicating purchase intent are six times more likely than all other searches to display this four-pack of ads. Searches with discovery intent have a 69% higher click-through-rate (CTR) for the top five search results, as compared to purchase-intent searches. That customer intent is everything, and that the ‘micro-moments’ that you will have heard Google recommending you pay attention to, should be right at the top of your search strategy. These all have three things in common – immediacy, context and intent. So going back to the BrightEdge research, Google is creating a pay-to-play battleground where the only winners will be the marketers who align their paid search efforts with customer intent. According to Google, examples of commercial queries include topics such as “hotels in New York City” and “car insurance”. Other examples are “CRM software” and “energy management systems”. Also note that research from Sirius Decisions indicates that 67% of the B2B buyer’s journey is now done online. The key to search marketing is supporting organic efforts with paid advertising, and filling the gaps when on-page SEO and content marketing isn’t enough. However you must understand that with Google becoming ever savvier about quality, it’s vital you’re creating content that’s trustworthy and relevant. So again, it’s now much harder for organic results to gain any love on SERPs for commercial search terms. The key is knowing which commercial terms have organic search results above the fold, so organic and paid search teams can work together in targeting these terms to boost ROI for both paid and organic efforts. You should also research which pages are currently ranking for these terms and create further webpages that help bolster this presence, by mapping content to exactly what searchers are looking for. And then for search topics where there are fewer ads displayed, organic search teams should take the lead in creating content that delivers on all points, from relevancy, to quality to user experience, in order to attract and retain customers. For more on the research, check the full report from BrightEdge. Does organic click-through rate (CTR) data impact page rankings on Google? This has been a huge topic of speculation for years within the search industry. Why is there such a debate? Well, often people get hung up on details and semantics (are we talking about a direct or indirect ranking factor? ), Google patents (which may or may not even be in use), and competing theories (everyone’s got an opinion based off something they heard or read). To make matters more confusing, Google is less than forthcoming about the secrets of their algorithm. But if CTR truly does impact Google’s organic search rankings, shouldn’t we be able to measure it? Yes! In this post, I’ll share some intriguing data on the relationship between Google CTR and rankings. I’ll also share four tips for making sure your Google click-through rates on the organic SERPs are where they need to be. To be clear: my goal with this post is to provide just a brief background and some actionable insights about the topic of organic click-through rates on Google. We won’t dissect every tweet or quote ever made by anyone at Google, dive deep into patents, or refute all the SEO theories about whether CTR is or isn’t a ranking factor. I’m sharing my own theory based on what I’ve seen, and my recommendations on how to act on it. Google CTR & rankings: Yes! No! Who bloody knows! Eric Enge of Stone Temple Consulting recently published a post with a headline stating that CTR isn’t a ranking factor. He clarifies within that post that Google doesn’t use CTR as a direct ranking factor. What’s the difference between a direct and indirect ranking factor? Well, I suggest you watch Rand Fishkin’s awesome video on this very topic. Basically, we know certain things directly impact rankings (I got a link from a reputable website, hooray! ), but there are many other things that don’t have a direct impact, but nevertheless do impact ranking (some big-time influencer tweeted about my company and now tons of people are searching for us and checking out our site, awesome!). It’s essentially the same issue as last touch attribution, which assigns all the credit to the last interaction. But in reality, multiple channels (PPC, organic, social, email, affiliates, etc.) can play important roles in the path to conversion. The same is true with ranking. Many factors influence ranking. So here’s my response: Direct, indirect, who cares? CTR might not be a “direct core ranking signal,” but if it impacts rank (and I believe it does), then it matters. Further, even if it doesn’t impact rank, you should still care! If you have great positions in the SERPs, that’s awesome. But even high rankings don’t guarantee visits to your site. What really matters is how many people are clicking on your listing (and not bouncing back immediately). You want to attract more visitors who are likely to stick around and then convert. Bottom line: Google cares a lot about overall user engagement with the results they show in the SERPs. So if Google is testing your page for relevancy to a particular keyword search, and you want that test to go your way, you better have a great CTR (and great content and great task completion rates). Otherwise, you’ll fail the quality test and someone else will get chosen. Rand Fishkin conducted one of the most popular tests of the influence of CTR on Google’s search results. He asked people to do a specific search and click on the link to his blog (which was in 7th position). This impacted the rankings for a short period of time, moving the post up to 1st position. But these are all temporary changes. The rankings don’t persist because the inflated CTR’s aren’t natural. Isn’t CTR too easy to game? The results of another experiment appeared on Search Engine Land last August and concluded that CTR isn’t a ranking factor. But this test had a pretty significant flaw ­– it relied on bots artificially inflating CTRs and search volume (and this test was only for a single two-word keyword: “negative SEO”). So essentially, this test was the organic search equivalent of click fraud. I’ve seen a lot of people saying Google will never use CTR in organic rankings because “it’s too easy to game” or “too easy to fake.” I disagree. Google AdWords has been fighting click fraud for 15 years and they can easily apply these learnings to organic search. There are plenty of ways to detect unnatural clicking. What did I just say about old tricks? Before we look at the data, a final “disclaimer.” I don’t know if what this data reveals is due to RankBrain, or another machine-learning-based ranking signal that’s already part of the core Google algorithm. Regardless, there’s something here – and I can most certainly say with confidence that CTR is impacting rank. NEW DATA: Does organic CTR impact SEO rankings? Google has said that RankBrain is being tested on long-tail terms, which makes sense. Google wants to start testing its machine-learning system with searches they have little to no data on – and 99% of pages have zero external links pointing to them. How is Google able to tell which pages should rank in these cases? By examining engagement and relevance. CTR is one of the best indicators of both. So here’s what we did: We looked at 1,000 keywords in the same keyword niche (to isolate external factors like Google shopping and other SERP features that can alter CTR characteristics). The keywords are all from my own website: wordstream.com. I compared CTR versus rank for one- or two-word search terms, and did the same thing for long-tail keywords (search terms between 4 to 10 words). Notice how the long-tail terms get much higher average CTRs for a given position. For example, in this data set, the head term in position 1 got an average CTR of 17.5%, whereas the long-tail term in position 1 had a remarkably high CTR, at an average of 33%. You’re probably thinking: “Well, that makes sense. You’d expect long-tail terms to have stronger query intent, thus higher CTRs.” That’s true, actually. But why is that long-tail keyword terms with high CTRs are so much more likely to be in top positions versus bottom-of-page organic positions? That’s a little weird, right? OK, let’s do an analysis of paid search queries in the same niche. We use organic search to come up with paid search keyword ideas and vice versa, so we’re looking at the same keywords in many cases. Long-tail terms in this same vertical get higher CTRs than head terms. However, the difference between long-tail and head term CTR is very small in positions 1–2, and becomes huge as you go out to lower positions. In paid search, long-tail and head terms do roughly the same CTR in high ad spots (1–2) and see huge differences in CTR for lower spots (3–7). But in organic search, the long-tail and head terms in spots 1–2 have huge differences in CTR and very little difference as you go down the page. Why are the same keywords behaving so differently in organic versus paid? The difference (we think) is that pages with higher organic click-through rates are getting a search ranking boost. CTR and ranking are codependent variables. There’s obviously a relationship between the two, but which is causing what? In order to get to the bottom of this “chicken versus egg” situation, we’re going to have to do a bit more analysis. The following graph takes the difference between an observed organic search CTR minus the expected CTR, to figure out if your page is beating — or being beaten by — the expected average CTR for a given organic position. By only looking at the extent by which a keyword beats or is beaten by the predicted CTR, you are essentially isolating the natural relationship between CTR and ranking in order to get a better picture of what’s going on. We found that, on average, if you beat the expected CTR, then you’re far more likely to rank in more prominent positions. Failing to beat the expected CTR makes it more likely you’ll appear in positions 6–10. Beats the expected CTR for a given position by 20 percent, you’re likely to appear in position 1. Beats the expected CTR for a given position by 12 percent, then you’re likely to appear in position 2. Falls below the expected CTR for a given position by 6 percent, then you’re likely to appear in position 10. If your pages fall below the expected organic Google search CTR, then you’ll find your pages in lower organic positions on the SERP. Want to move up by one position in Google’s rankings? Increase your CTR by 3%. Want to move up another spot? Increase your CTR by another 3%. If you can’t beat the expected click-through rate for a given position, you’re unlikely to appear in positions 1–5. Essentially, you can think of all of this as though Google is giving bonus points to pages that have high click-through rates. The fact that it looks punitive is just a natural side effect. If Google gives “high CTR bonus points” to other websites, then your relative performance will decline. It’s not that you got penalized; it’s just that you didn’t get the rewards. Many “expert” SEOs will tell you not to waste time trying to maximize your CTRs since it’s supposedly “not a direct ranking signal.” “Let’s build more links and make more infographics,” they say. AdWords and many other technologies look at user engagement signals to determine page quality and relevance. We’ve already seen evidence that CTR is important to Google. Optimize pages with low “organic Quality Scores.” Download all of your query data from the Google Search Console. Sort your data, figure out which of your pages have below average CTRs, and prioritize those. Don’t risk turning one of your unicorn pages with an awesome CTR into a donkey with a terrible CTR! It’s far less risky turning a donkey into unicorn! Combine your SEO keywords with emotional triggers to create irresistible headlines. Emotions like anger, disgust, affirmation, and fear are proven to increase click-through rates and conversion rates. If everyone who you want to beat already has crafted optimized title tags, then packing an emotional wallop will give you the edge you need and make your listing stand out. Work to improve other user engagement metrics. Like click-through rate, we believe you need to have better-than-expected engagement metrics (e.g. time on site and bounce rate). This is a critical relevance signal! Google has enough data to know the expected conversion and engagement rates based on a variety of factors (e.g. industry, query, location, time of day, device type). If your content performs well, you’re likely going to get a rankings boost. If your content does poorly, there’s not necessarily a penalty, but you definitely won’t get any bonus points. Use social media ads and remarketing to increase search volume and CTR. Paid social ads and remarketing display ads can generate serious awareness and exposure for a reasonable cost (no more than $50 a day). If people aren’t familiar with your brand, bombard your target audience with Facebook and Twitter ads. People who are familiar with your brand are 2x more likely to click through and to convert! Just say no to low Google CTRs! You want to make sure your pages get as many organic search clicks as possible. Doing so means more people are visiting your site, which will send important signals to Google that your page is relevant and awesome. Our research also shows that above-expected user engagement metrics result in better organic rankings, which results in even more clicks to your site. Don’t settle for average CTRs. Be a unicorn in a sea of donkeys! Raise your CTRs and engagement rates! Get optimizing now! This article was originally published on the Word Stream blog, reprinted with permission. You don’t have to be an SEO expert to optimise your content in just a few steps and improve your page’s ranking on search engine results pages (SERPs). SEO might sound complicated for beginners, but in fact, everyone can start applying a few basic tips that will affect a post’s performance and eventually its ranking. WordPress can be very helpful for easy SEO optimisation, as it allows everyone to perform a series of quick steps to help search engines find your content. There are many plugins that can guide you with the optimisation of your content, while they can also measure your post’s performance in terms of SEO success. How often do you use your focus keywords? Does your content pass the readability test? Should you use more headings? ‘All in One SEO pack’, ‘SEO by SQUIRRLY’, and ‘Yoast SEO’ are among the most popular SEO plugins, but you can find numerous others to suit your needs and simplify the process of optimisation. From page analysis to a sitemap generator, WordPress plugins can help you understand how SEO works, which may eventually help you improve your content to make it more appealing, both for your audience, but also for search engines. A post’s headline is the user’s first impression on your content and this will affect whether the exposure will lead to an actual click, or not. The title tag should be an accurate description of your content aiming to capture the audience’s attention, while helping search engines discover your content with the right optimisation. Title tag was always an important part of on-page SEO optimisation, but Google’s semantic search has changed the rules of the game, encouraging people to think more of their audience and less of the keywords. It’s not necessary anymore to use a specific keyword in your title tag, although it may be useful if you manage to use it in context, helping users understand more of the topic you’ll be covering. According to a research by Backlinko, keyword-optimised title tags may still be associated with better ranking, but not in the same way that it mattered in the past. A compelling title manages to attract both the readers and the search engines in less than 60 characters, which is more challenging than it seems, but it may also lead to an increased traffic. If you want to improve the craft of coming up with great headlines, then CoSchedule may help with its Headline Analyzer, which allows you to understand what makes an effective headline both for humans and search engines, ranking your titles and measuring it depending on its length and the type of words that you used. Good formatting is appreciated both by humans and search engines, as it makes the content more appealing. Headings help the text’s readability by dividing it into smaller blocks, with <h1> serving as the part that needs to be highlighted more than the rest and <h2>, <h3>, <h4>, <h5>, <h6> creating an additional layer of importance compared to the normal paragraph text. Each heading has a different size, in order to be easily distinguished, creating a hierarchical structure that increases the chances of users spending more time reading (and skipping to relevant) content. Headings should follow the guidelines of the titles, be appealing and descriptive, and separate long blocks of content by creating a visual appeal. In terms of SEO optimisation, headings help search engines spot the most important parts of your content and discover the topic that you’re writing about. In fact, according to Searchmetrics, pages tend to use more H1 tags since 2014, while the presence of H1 and H2 tags also aid the user experience. URLs should be simple and clear both for humans and search engines. Although search engines are able to crawl even the most complex URL, it is still preferable to keep the URL simple, useful and relevant. As the URL is displayed in the SERPs along with the title and the meta description, it needs to convey the necessary information for your content, while its length may encourage the sharing of the content. There are many options in WordPress on how to create an automatic URL, but once again, simplicity is preferred, as a shorter URL may help readers (and search engines) discover your post’s actual content. Meta descriptions provide a summary of the page’s content to search engines and should provide a concise and relevant description of your post, serving as a preview for readers, helping them decide whether they are going to visit the page or not. According to Survey Monkey, 43.2% of people click on a result based on its meta description, which means that you need to use wisely the 160 characters maximum length. A meta description should follow the rules of your actual content, be descriptive and well written, without overusing keywords for the sake of search engine optimisation. Even if you include your targeted keyword, make sure it is provided in context, always thinking of your audience first. Semantic search has affected the impact of keywords in the description, but this doesn’t mean that they are still not used. It was back in 2009 when Google announced that meta descriptions and meta keywords don’t contribute to its ranking algorithms for search, but we still need to remember their importance as part of the preview snippet in SERPS, which is another case of putting the audience first when optimising. Links were always important for SEO optimisation, but this led to many manipulative techniques in the past. Search engines have moved to the age of semantic context, which means that links may still be significant, but in a more relevant and useful way. Internal links can enhance the user experience, as they help the audience navigate through your own site, in order to read further relevant posts. Any well-written link that is useful aims to allow a reader to continue its navigation through the site, boosting the content’s authority by linking a series of quality posts. This also affects the crawlability of your content, as search engines perceive your posts as informative and relevant. External linking was used cautiously in many occasions, out of fear that such a link only favours the linked source and not your own content, but this is not the case. By adding links to external sources that are relevant to your content you are boosting your own authority, helping search engines understand your niche topic and reward you for your linking that aims to add value to your own post. External linking helps search engines learn more about your content, improving your credibility and even your ranking. Backlinks were always an integral part of SEO optimisation, as they serve as the proof that your content is appreciated by others, improving your authority to a particular field. Although Google is not keen on “unnatural” linking that serves no particular purpose, a backlink of high quality is always welcome, as it contributes both to your site’s ranking factors, but also to your content’s authority. During the past year we’ve seen a decrease of backlinks using a keyword to the anchor text and this is related once again to Google’s attempt to combat any kind of manipulative link with no context. Any backlink from a highly trusted source may eventually lead to an increase of traffic and a boost in the search ranking factors and the best way to achieve it is to keep producing quality and informative content that will offer a unique perspective in its relevant field. Images do not just enhance the reading experience for your audience, but they are also important in your SEO optimisation. As users can find your images directly through Google’s Image Search, it’s important to pay attention to their naming, in order to increase the chances of bringing traffic back to your site or boost your site’s ranking. 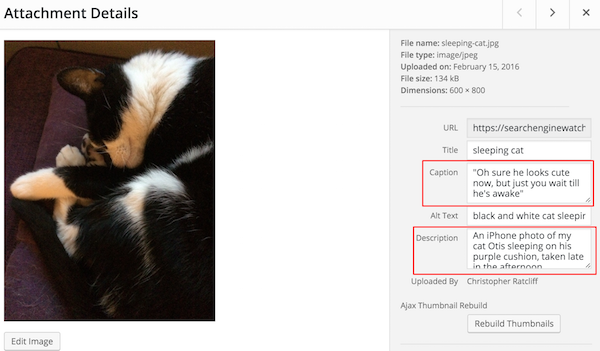 Image optimisation for SEO is simple, but it’s sometimes overlooked as a boring task. However, it’s great when a user discovers your content through image search, associating an image with your content and that’s why you should tart spending a few minutes to optimise your images from now on. As well as the filename, which serves as the image’s title, it is also crucial to add “alt” text, which is essentially the description of your image. This section is about providing alternative text for your image, which will be displayed to a user’s browser if there is a problem with the actual image. As search engines can only read and not ‘see’ an image, the alt text should be indicative of your file, trying to describe it in the best possible way. Your description should be clear and concise and if you still need help with finding the right text to describe your image, keep in mind that alt text is used by screen reader software to describe an image to people with visual impairments. It’s always useful to analyse the performance of your posts, with metrics and conversions helping you understand your content at a deeper level. However, there is an indication that metrics such as the bounce rate and the SERP click-through-rate affect ranking, which makes their analysis even more important. According to Backlinko, websites with low average bounce rate are ranking higher on the search results and despite the uncertainty regarding the direct correlation between these two, it still reminds us that engaging content offers numerous benefits for a site. It’s the time spent on site along with the bounce rate that can lead to very interesting insights for your content, in order to discover what your audience likes and what needs to be improved. Furthermore, the click-through rate has an even closer relationship with SEO, as it affects the content’s ranking position on SERPs, using the number of clicks as an indication of a content’s popularity, as this validation comes directly from your readers. Keywords may be among the most commonly used words along with SEO, but in 2016, it’s more important to focus on the quality of the content rather than the target keyword. It’s the readability that will affect your search rankings more than the right use of a keyword, as the first one may improve the user experience, the level of engagement and the time spent on the site, while the use of keywords without a content of high quality simply looks like an automatic text, without taking into consideration the human factor. You can measure the readability of your content with WordPress plugins such as Yoast SEO and FD Word Statistics, while there are also many online tools, including Readability-Score and the Readability Test Tool. Except for the goal of readability, you still need to add relevant keywords to your text, as they are still affecting the search ranking factors, provided that they are added naturally as part of your text, adding value and context to it. Everyone loves fresh content, including search engines. By regularly creating new content you are increasing the chances to become an authority in your field, which may favour your ranking and boost your traffic. You don’t have to create new content daily, but consistency and relevance will be highly appreciated, both by your audience and the search engines. As you keep adding more valuable content, visitors will keep coming back, increasing the engagement while building your credibility. Never sacrifice quality over quantity though, as this won’t be appreciated neither by readers, nor by search engines. The majority of enterprise content marketers don’t have a documented strategy, according to recent research. The CMI found that almost two thirds of professional content folk haven’t yet bothered to write down their strategy. In some circles that’s akin to not having a strategy at all, but I don’t find it particularly surprising. Plenty of experienced, established teams seem to work without documentation in place, but it seems to me that content marketing has evolved to the point where it’s really easy to lose focus. I’m currently going through the process of establishing a content strategy from scratch and thought I’d share what I’m doing, which I’ve summarised in the visualisation below. I guess each of these areas could be a chapter heading in a handy reference guide for the team. All pretty top level, you understand, but I’ll explain a bit about each area below. What do we mean by ‘document’? There’s no standard template for this, so far as I know. In any event, what’s right for me might be wrong for you. But I would say that your ‘documentation’ should amount to more than a simple mission statement. Big picture strategy slogans are one thing, but to actually make things happen, you need a lot of detail. Your team needs to know where to look – or who to look to – when they want something. If you don’t have proper documentation in place, then they will look to you, and you will turn into a repetitive answer machine. Heavy bummer. It might be that a lot of the supporting documentation already exists, in some shape or form. It’s just that it is unfinished, or out of date, or unstructured, and very possibly unshared. Why not put some time aside to get things together? Assembling a collection of useful documents – alongside a goal-orientated series of targets – will help you to keep things on track. Your team will thank you for it, especially newcomers. Let’s go through the four key areas to think about (Goals, Tactics, People, Processes), and the three others that are loosely filed under productivity (Assets, Tools and Tech). In business, everything revolves around goals, unless you’re batshit crazy, so I’ll start there. Content marketing teams exist to support all kinds of businesses goals. Some are more important than others. Goals can be strategic, tactical or based around task completion. Macro, micro, nano. Company, department, team member. Or mission, campaign, task. Goals should be written down and ideally visible across teams, since you rarely work in a vacuum. Performance stats should be visible too, because transparency is a winning ticket. Note that you always, always, always need a feedback loop, to measure what works and what doesn’t. Without that you cannot hope to function properly, nor maximise your chances of success. Nor, for that matter, demonstrate ROI (or the lack of it). Targets. You can use tools to set, assign and monitor goals, or just put something together in Google Docs and share it with whoever needs to see it. Metrics. Once clearly defined goals and targets have been set you can take some measurements and track metrics as you move forwards. Set up your analytics reports and monitor performance as you progress. Once you know what your goals are, you can figure out how to go about achieving them. This is where tactics come into play. Research. Gut feel is a fine place to start, but tactics should be based around insight, rather than opinions. This calls for some research. Use whatever sources of data and information you can to build up a picture of the world according to your target audience. Audience research. Figure out needs, where they like to hang out, what makes them tick, what they respond to, which competitors they talk about, who their friends are, who they respect… that kind of stuff. Customer research. You need to know who your existing customers are before finding similar people. How do customers interact with your brand? What works? Competitor research. It’s worth having a sniff around but there’s no need to obsess over competitor activity. Worry about your own game. Planning is a natural extension of worrying. Personas and user journeys. Put together some personas, user stories, customer journeys, and make sure everybody is aware of the paths you want visitors to take. Keyword research. This is rather more audience-centric than the foundational technical SEO basics, such as making your site fast. Search queries reflect consumer intent, and it is your job to create the kind of content that ranks well for target phrases. Keyword research works best when it is truly strategic, with content mapped to specific business goals. Your content comes only after you have defined and prioritised your keyword wishlist. Or you’re doing it wrong. Incidentally, I pretty much live by Dan Shure’s brilliant article on using the Keyword Planner in a creative way. Funnel. How do your customers actually become customers? Understand the various journeys through the funnel. See what’s working, and think about how your content can play a role at each stage. Content mapping. Great, you’ve mapped content throughout the funnel, but happens after somebody has become a customer? Increasing retention and customer advocacy are two of the best things you can do in business, and your content can go a long way in supporting these primary business goals. Take ownership, if necessary. Formats. After you’ve done your homework, you can start to think about the actual content. Thoughts will turn to the type of content you might create, and the formats you can use. What is possible, given your team, your budget and your platforms? Distribution. Hold up, cowboy. Don’t let the tail wag the dog. In this case the tail is content. And the dog, well, that’s distribution. Simply put, why are you making a video when you haven’t given a moment’s thought to YouTube? And what feeds YouTube? Ah yeah, reddit does. These channels are potentially going to be the difference between a small win in local circles and a global viral. Why wouldn’t you want to optimise your distribution channel strategy? How will people find your article? What’s your social strategy? Are you going to do any paid distribution? How are you going to nail down some excellent Google placements? Figure out how to get the best out of your main channels, and you’ll get way more bang for your buck from each piece of content. SEO. The devs probably need to be informed about your preferred search setup. Right? Once you’ve got this together it becomes much easier to direct your efforts, and change tack if necessary. The main success factor will be linked to the quality of content you create, and that’s something that you can also provide documented guidance on. Share internal and external knowledge, and make it easily accessible across teams. You may know who everybody is and why they matter, but does the rest of your team? Think about the various people who stand to benefit from your success, and always remember the ones who took on some risk when you started out. Stakeholders. Not just the boss, but heads of other teams that will be affected by your efforts. Who are they? What do they need to be effective in their jobs? How can content marketing support their primary goals? Also, what have you promised? Make the business case readily available to your team so they know what is expected of them. Share presentations and team goals. Content team. Who’s in the dream team? Who is your star player? What is everybody focusing on? How does everybody communicate? That might be as straightforward as sharing a simple organogram and a bunch of invitations to Slack. Other teams. Who do you ask for a new button to be designed? Where do the company mugshots live? Is there a shared Dropbox folder? What are the guidelines around using this stuff? External talent. Maybe you hired a PR agency, who should be kept in the loop about major content campaigns on the horizon. Maybe you have three freelance writers who don’t work in our office. And that weird guy who makes kickass videos from a shady basement. How will these people work together and where do their contact details live for when somebody needs something? Influencers. This is really important: know who you want to get friendly with. These community-annointed leaders of tribes can help you in a big way. What can you do to attract their attention? I tend to store influencers (including media lists) in a spreadsheet. Other people’s Twitter Lists can be a goldmine. This is where the action happens. What are the things to do before and after publication? What do you need to do to get a piece of content over the line? Brainstorming. Where do we store our ideas? How often do we get together? What tools do we use? What’s the formula for deciding what kind of content to create? Whiteboard sessions and mindmaps all play their part. Workflow. How do we operate as a team, and as team members? How should we work with other teams? What is the process for submitting work? What tools do we use? I’ve played around with Trello to Basecamp to Google Docs but have never settled on one goal-orientated platform (so I’m actually building one). People use tools differently and there is often some kind of protocol to follow, otherwise your world looks like to-do list spaghetti. Taxonomy. What’s that you say about metadata? What is the common vocabulary for labels, tags and categorisation? Should I write Ecommerce or ecommerce or e-commerce or E-commerce or eCommerce? How does the tech work to support this kind of thing? If you have some rules in place, then you should police them. Checklists. What needs to be done prior to publication? Or sign off? What boxes need to be ticked? Did you sense check everything? Sign Off. Is there a sign off process? Who has final say? Do we really need to run everything past the PR agency? Who has publishing rights? Who is allowed to edit? Assets, tech and tools pretty much sit between the three key areas and the goals. I see these things as being very much in the heart of the practical, and used, referenced and updated during the production phase. Assets are things like brand guidelines, which should cover all of the dos and don’ts you need to know before publishing even the smallest status update. Authors must know your brand inside out before they represent it, right? You’ll also need a house style guide, for content creators and editors. And ideally some pointers about things like when to publish, or how to write amazing headlines. You’ll also be primed for success if you go to the trouble of creating (and maintaining) a schedule, be a that a shared calendar or loose, spreadsheet-based plan of action. Put some dates in the diary, get some targets in place, and watch out for the things on the verge of falling off the radar (or worse, the dreaded blockers). Tech covers off the various platforms you will use (owned, earned, rented, paid, etc). That might mean a blog, a YouTube channel or a paid media channel. It’s probably all three. Tech also points to your kit, and how the tech team can help improve efficiency and performance. For example, if you’re blogging, what are your CMS needs? How could the editing interface be improved? How should you report bugs? This might mean JIRA tickets, or something similar, so let your team know about how best to wave flags. Platforms and technology can be optimised, which is where UX comes into play. Content lives at the heart of UX, but there are obviously factors outside of the content team’s control. Be sure to bang the drum if your site is slow, or if something is broken. UX also covers persuasion, which is something of an artform among switched-on content marketers. Then we have Tools, which primarily sit between people and process, and should help you to get things done. Pretty self-explanatory. It’s worth pausing for thought if you are part of an existing team and you don’t have the right documentation in place. Where should I look for that style guide? Exactly what kind of person am I writing for, and why? Who should sign this off? These are questions that no right-minded team leader wants to answer on a daily basis. Or maybe, like me, you’re starting something up, or you have a new client and a blank page. It’s tempting to jump straight into content creation, but in the long run it’s going to be way better to put a well-documented plan of attack in place, with goals and supporting assets all neatly lined up. Either way, it’s worth regularly reviewing your strategy and updating your documentation, especially when adjusting course. To that end, I created The Content Strategy Canvas to help you get together a top level picture of what you have going on (click the pic for a big, hi-res version). The canvas appears overly simplistic, but it is meant to be that way. It is a visual tool to help quickly communicate the key aspects of strategy on one page. No fluff required. The other documentation you might assemble having read this post will fill in the gaps. And lo, you will become a cherished hero. Anyway, that’s where I’m at. I’ll share a few specific content marketing templates in the future. I’d certainly love to hear any feedback and other approaches, so do leave a comment below or get in touch. Consumers aren’t born in a vacuum, nor do they live in one. They’re inundated with a brand’s messages, ideas, discussions, and controversy across all of their digital and offline encounters. As businesses and marketers, we must not only educate novice buyers on the benefits of a product, but also engage educated potential customers who already have some knowledge of their choices and are making final decisions between products. The first step in this process is identifying the needs of the consumer at each of the stages where they’ll be searching for products. What drives their curiosity? What is creating their need? A strategic response to this question can be pursued in several different ways. A good way to begin is surveying your website visitors. Onsite surveys can be a powerful way to gain an understanding of customers and what information they’re after. Think of engaging ways to talk to your audience in this way, putting them on their journey to being a customer. You may have already started tracking visitor activities in your analytics platform – analytics that you can tie to a stage in your customer’s lifecycle. In the B2B sector, this can mean a visitor downloading a whitepaper that gives some entry-level explanation of your product category, or, on the B2C side, could include a customer adding a specific product to his shopping cart on your website but not completing the purchase. These are all opportunities to re-engage audiences by understanding how they arrived at their current stage. The next step is employing a marketing automation system that helps communicate with customers throughout their journey. Revising and fine-tuning this system can pay extensive dividends. Take the time to review your customer touchpoints and make sure customers at every leg of the journey are getting the information they need at that stage. You should also take time to understand your competitors’ offerings, how they are presented, and decipher how they are interpreting the customer journey. Through awareness and insight into your competitors, you can really recognize communication opportunities for those educated consumers that have a keen understanding of the marketplace. From there, you can offer them valuable resources that may not be available anywhere else. So you now have all of these data points, and can identify needs and curiosities across your customer journey – how does that play into a search engine optimization strategy? The next phase is evaluating your content and aligning it to the customer journey. This should uncover any gaps in your content where adding helpful resources will likely prove beneficial to your consumers. Are there pieces of content that would make your customers’ decision process quicker or smoother? These resources may provide value simply by giving your customers more assurance that they are making the right decision (remember that competitor analysis you did?). With content gaps identified, is there a variation of that content theme that prospective buyers are searching for more than something else? This is where you start your keyword research. As you are working through that keyword research, though, always keep customer intent in mind. Just because a keyword has a high search volume and low competition does not necessarily mean that the related content is right for your audience. Don’t be afraid to test content and get feedback from your customers (and even from your potential customers). Understanding how your audience uses and digests your content will help inform the shape that your future content should take. Use your analytics to continually gauge the effectiveness of your content. Try changing up headlines, where the links to content pieces are located, and which pieces of content get priority placement on the page. All of these tests can expose those hidden gems of design wisdom that make your site the resource your potential and existing customers turn to when they need answers. You need to really get to know how your customers think, develop content that they need across their entire journey, and test to see what works best at each stage. Your success will come not only from customers that experience satisfying visits to your site, but also from delivering better experiences for potentially your most influential site visitors of all – the search engines. Kevin Gamache is Senior Search Strategist at Wire Stone, an independent digital marketing agency. Five years ago, in April 2011, Zappos’ market share in Google was more than three times as large as Nordstrom‘s. Today, Nordstrom has twice the market share on Google as Zappos. During the time between April 2011 to December 2012, Zappos.com managed to increase its market share by 51% (going from a visibility score of 42.9 to 63.42 points), while Nordstrom increased their visibility 13 points to 54.9. A huge jump in market share by 302%. At this point, they became a direct competitor to Zappos, with both domains having 50% of their keywords in Google in common. In September 2013, Nordstrom.com took off, leaving Zappos.com in the dust. Since then, Nordstrom.com has continuously increased its market share, climbing by 65% from September 2013 until today, with a visibility score of 90.78 points. During the same time, Zappos.com continuously lost market share and ended up at a -37.32% loss, dropping from 63.42 to 39.75 points. We can see that links are not a problem for Zappos. They actually have nearly a million and a half links, from about 5,000 domains, more than Nordstrom. 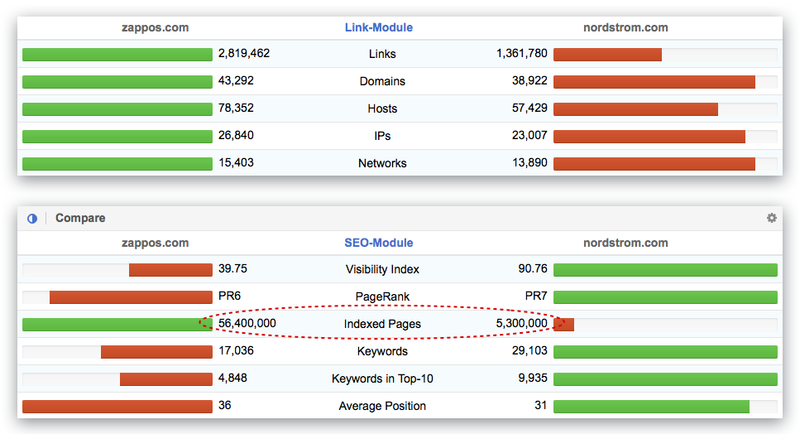 The thing that quickly catches the eye is the large discrepancy in the amount of indexed pages for both domains. Zappos has a whopping 56 million pages indexed and that can be a huge problem. If we look at the number of keywords for which Zappos has a Top 100 ranking (17,000) and compare it to the number of indexed pages, we get a ratio of 3,310 indexed pages for every keyword in the Top 100. Zappos has quite a large number of product pages in the Google index which are not available anymore. At the same time, these pages are set to index/follow. Ironically, they also have popular products, which ARE available, set to noindex/follow. All these problems together will cause Google to crawl unnecessary URLs, which will deplete the crawl-budget for the domain. And this crawling power will be sorely missed, especially for such extensive projects. Additionally, this crawling budget will define how often Googlebot crawls the first few levels of the domain and how often a deep crawl will take place. We see something similar with the indexing budget: this budget decides on the maximum number of URLs which will be added to the Google index. It is important to keep in mind that only URLs which are crawled regularly will stay within the index. It could all be so easy. In theory, every piece of content should have a unique, logical, easy to understand URL, which stays exactly the same over the decades. All of this will end the same way: Google will crawl unnecessary URLs and waste the domain’s crawling budget. We can see that Nordstrom decided to compete with Zappos on about 50% of its keywords. For quite a while, both domains competed directly at the same level of visibility. Though in the end, Zappos’ onpage problems and a change in user behaviour has let to a stark contrast in visibility for both Domains. If we look at which keywords both domains rank for, we notice that, in the beginning, Nordstrom only ranked for 23% of the keywords which Zappos had. Only three years later, Nordstrom already managed to rank for 50% of Zappos’ keywords. This change shows us that Nordstrom actually decided to actively work on competing with Zappos. Today the tables have turned and Nordstrom directly competes on 67% of Zappos’ keywords. When we talk about user behaviour, we mean that, if the user has a choice between both a result on Nordstrom and Zappos, they will decide to go to Nordstrom.com. We can see this thanks to Google Trends. The user interest for both domains part ways in Mid 2012, just as direct competition started. This post was originally published on the Sistrix blog, reprinted by permission. Baidu, the leading Chinese search engine, is the third most popular search engine in the world, despite being mostly concentrated in and around China. That speaks clearly to the immense size and power of the Chinese market. An estimated 507 million Chinese use search engines. This is an enormous marketplace for companies who want to grow overseas and engage with new prospective customers. Although Google dominates much of the search engine traffic in North America and Europe, in China it is one of the least popular search engines. Instead, Baidu, and its rising competitor Qihoo 360, control the landscape. Those interested in doing business in China will need to make sure they understand these search engines if they want to compete. The market in China is quickly changing and evolving. Baidu has long dominated the search engine sphere, and they still control an estimated 54% of the search engine market share. Over the past few years, however, there has been a fast rising competitor that is seizing an increasing percentage of the search volume. Qihoo 360 was developed by a security software company and its search engine so.com. It was only launched in 2012, but by 2015 it controlled an estimated 30% of the Chinese search market. Its popularity has likely been influenced by the growth of mobile. By Q3 in 2014, mobile devices were the leading source of searches and revenue for Chinese search engine marketing, and Qihoo 360 has been responsible for building the most popular app store in China. How is search engine marketing different in the APAC region than in the US? Brands who want to expand overseas into the APAC region need to be familiar with the local ranking factors and how to conduct SEO for the popular search engines, particularly Baidu and so.com as optimizing for one site will allow you to improve your rankings on both. Do not try to get a website ranked by using automatic translators or just students of the language. Using a native speaker will provide you with an infinitely superior site, as you will be able to avoid major grammatical errors, have the content flow more naturally, select more relevant keywords and use vocabulary that resonates better with the local audience. Your site will fit better overall into the framework of the Chinese digital ecosystem. Translation issues can hurt your reputation and cause you to rank lower on the SERPs. When setting up a website, you want to try and get a .CN domain. If that is not possible, then seek a .COM or .Net. You website should also be hosted in China and you should secure an ICP license from the Chinese Ministry of Industry and Information Technology. Avoid having multiple domains or subdomains. It is imperative that you know the list of blacklisted words that cannot be posted online. Inclusion of these words can cause your site to be de-indexed and even taken down. Remember that your website can not criticize the government in any way. As you build the website, keep your title tags under 35 characters in Simplified Chinese and your meta descriptions below 78 characters in Simplified Chinese. Website speed is highly valued. Regularly test your site to make sure it loads quickly. Inbound links are also viewed as valuable for search rankings, so finding opportunities to build a strong backlink profile can be very helpful. The Chinese search engines value fresh content. So regularly publishing on your page will help boost your reputation and success. You should submit your blog posts to the Baidu News Feed, which will help you attract new readers to your material. For businesses interested in expanding into Asia, understanding how the local search engine market is evolving and changing can be critical to creating sites that rank well on the local search engines. For business expanding globally outside of the US, make sure you optimize for premium search engines for key regions such as Naver (South Korea) and Yandex (Russia) also! The Search Console (or Google Webmaster Tools as it used to be known) is a completely free and indispensably useful service offered by Google to all webmasters. Although you certainly don’t have to be signed up to Search Console in order to be crawled and indexed by Google, it can definitely help with optimising your site and its content for search. Search Console is where you can monitor your site’s performance, identify issues, submit content for crawling, remove content you don’t want indexed, view the search queries that brought visitors to your site, monitor backlinks… there’s lots of good stuff here. If you don’t have a Search Console account, then you should get one now. You may find that you won’t actually need some of the other fancier, more expensive tools that essentially do the same thing. To get started, all you need is a Google sign-in, which you probably already have if you regularly use Google or Gmail, and visit Search Console. Then follow this complete guide which will take you through every tool and feature, as clearly and concisely as possible. Please note: we published a guide to the old Webmaster Tools service, written by Simon Heseltine, back in 2014. This is an updated, rewritten version that reflects the changes and updates to Search Console since, but much of the credit should go to Simon for laying the original groundwork. If you haven’t already, you will have to add your website to Search Console. Just click on the big red Add a Property button, then add your URL to the pop-up box. Before Search Console can access your site, you have to prove to Google that you’re an authorized webmaster. You don’t have be in charge, but you do need permission from whoever is. 1) The HTML file upload: Google provides you with a HTML verification file that you need to upload to the root directory of your site. Once you’ve done that, you just click on the provided URL, hit the verify button and you’ll have full access to Search Console data for the site. 2) HTML tag: this provides you with a meta tag that needs to be inserted in the <head> section of your homepage, before the first <body> section. If you make any further updates to the HTML of your homepage, make sure the tag is still in place, otherwise your verification will be revoked. If this does happen, you’ll just have to go through the process again. 3) Domain Name Provider: here you’re presented with a drop down list of domain registrars or name providers, then Google will give you a step-by-step guide for inserting a TXT record to your DNS configuration. 4) Google Analytics: assuming you’re using Google Analytics and your Google account is the same one you’re using for Search Console, then you can verify the site this way, as long as the GA code is in the <head> section of your home page (and remains there), and you have ‘edit’ permission. 5) Google Tag Manager: this option allows you to use your own Google Tag Manager account to verify your site, providing you’re using the ‘container snippet’ and you have ‘manage’ permission. Now that you’re verified, you’ll be able to see your site on the Home screen. (As well as any sites you’re also a webmaster for). Here you can access the site, add another property and see how many unread messages you’ve received from Google. if you click on your site, you will be taken to its own unique Dashboard. For the purposes of the following walk-throughs, I’ll be using my own website Methods Unsound, which means you can see all the things I need to fix and optimise in my own project. Here’s where you can access all of your site’s data, adjust your settings and see how many unread messages you have. The left-hand Dashboard Menu is where you can navigate to all the reports and tools at your disposal. The three visualisations presented on the Dashboard itself (Crawl Errors, Search Analytics, and Sitemaps) are quick glimpses at your general site health and crawlability. These act as short-cuts to reports found in the left-hand menu, so we’ll cover these as we walk-through the tools. Also note that Google may communicate a message directly on the dashboard, if it’s deemed important enough to be pulled out of your Messages. As you can see I have errors on my AMP pages that need fixing, but we’ll look at this when we get to the Dashboard Menu section further down. Clicking on the gear icon in the top right corner will give you access to a variety of simple tools, preferences and admin features. This is simply where you can set your email preferences. Google promises not to spam you with incessant emails so it’s best to opt-in. Here’s where you can set your preferred domain and crawl rate. Preferred domain let’s you set which version of your site you’d like indexed and whether your site shows up in search results with the www prefix or without it. Links may point to your site using http://www.example.com or http://example.com, but choosing a preference here will set how the URL is displayed in search.Google states that: “If you don’t specify a preferred domain, we may treat the www and non-www versions of the domain as separate references to separate pages” thus cannibalising your search visibility. Crawl rate lets you slow down the rate that Googlebots crawls your site. You only need to do this if you’re having server issues and crawling is definitely responsible for slowing down the speed of your server. Google has pretty sophisticated algorithms to make sure your site isn’t hit by Googlebots too often, so this is a rare occurrence. This is where you tell Google if you’ve migrated your entire site to a new domain. Once your new site is live and you’ve permanently 301 redirected the content from your old site to the new one, you can add the new site to Search Console (following the Add a Property instructions from earlier). You can then check the 301 redirects work properly, check all your verification methods are still intact on both old and new sites, then submit your change of address. This will help Google index your new site quicker, rather than if you just left the Googlebots to detect all your 301 redirects on their own accord. If you want to see Search Console data in Google Analytics, you can use this tool to associate a site with your GA account and link it directly with your reports. If you don’t have Google Analytics, there’s a link at the bottom of the page to set up a new account. Here you can see all the authorized users of the Search Console account, and their level of access. You can add new users here and set their permission level. Anyone listed as an Owner will have permission to access every report and tool in Search Console. Full permission users can do everything except add users, link a GA account, and inform Google of a change of address. Those with Restricted permission have the same restrictions as Full permission users plus they only have limited viewing capabilities on data such as crawl errors and malware infections. Also they cannot submit sitemaps, URLs, reconsideration requests or request URL removals. You can unverify individuals here (providing you’re the owner). Another Google platform, such as a G+ or AdWords, can be associated (or connected) with your website through Search Console. if you allow this association request, it will grant them capabilities specific to the platform they are associating with you. If you add an associate, they won’t be able to see any data in Search Console, but they can do things like publish apps or extensions to the Chrome Web Store on behalf of your site. Here’s where you’ll find all your reports and tools available in the Search Console. Let’s look at each option one-by-one. Here’s where Google communicates with webmasters. Again, you won’t get spammed here as Google promises not to bombard you with more than a couple of messages a month. You do need to pay attention when you do receive one though as this is where you’ll be informed if your site’s health is compromised. This can be anything from a rise in 404 pages, to issues with crawling your site, or even more serious problems like your site being infected with malware. If you click on the ? icon to the right of ‘Search Appearance’ a handy pop-up will appear. Search Appearance Overview breaks down and explains each element of the search engine results page (SERP). By clicking on each individual element, an extra box of information will appear telling you how to optimise that element to influence click-through, and where to find extra optimisation guidance within Search Console. Structured data is a way for a webmaster to add information to their site that informs Google about the context of any given webpage and how it should appear in search results. For example, you can add star ratings, calorie counts, images or customer ratings to your webpage’s structured data and these may appear in the snippets of search results. The Structured Data section in Search Console contains information about all the structured data elements Google has located on your site, whether from Schema markup or other microformats. It will also show you any errors it has found while crawling your structured data. If you click on the individual ‘Data Types’ it will show you exactly which URLs contain that particular markup and when it was detected. If you click one of the URLs listed, you can see a further breakdown of the data, as well as a tool to show exactly how it looks in live search results. Just click on ‘Test Live Data’ and it will fetch and validate the URL using Google’s Structured Data Testing Tool. Data Highlighter is an alternative to adding structured data to your HTML. As the explainer video below says, it’s a point and click tool where you can upload any webpage then highlight various elements to tell Google how you want that page to appear in search results. There’s no need to implement any code on the website itself and you can set the Data Highlighter so it tags similar pages for you automatically. After you hit publish, Google will take your added structured data into account once it has recrawled your site. You can also remove any structured data by clicking ‘Unpublish’ on the same page if you change your mind. This is where Search Console will recommend any improvements to your meta descriptions and title tags, as well as informing you of any non-indexable content. This is a very handy, easy-to-use feature that gives you optimisation recommendations that you can action right away. For instance, if I click on the ‘Short meta descriptions’ link, I’ll be able to see the 14 URLs and their respective meta descriptions. I can then go into each one of these pages in my own CMS and add lengthier, more pertinent text. Title tags and meta descriptions should be unique for each page and fall within certain character lengths, so for the purposes of both user experience and keeping Google informed about your site, this is a worthwhile report. Sitelinks are the subcategories that appear under the main URL when you search for a brand or a publisher. Sadly you can’t specify to Google which categories you want highlighted here, but if you’re popular enough and your site’s architecture is solid enough then these will occur organically. However in the Sitelinks section of Search Console, you can tell Google to remove a webpage that you DON’T wish to be included as a sitelink in your search results. 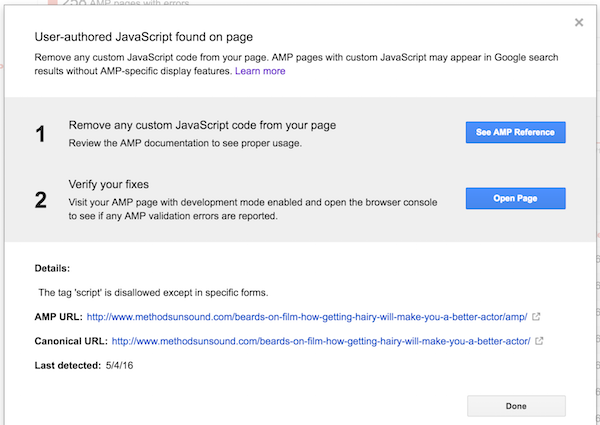 This is a brand new tool, as Google’s AMP programme has only been available since earlier this year. AMP is a way for webmasters to serve fast-loading, stripped down webpages specifically to mobile users. Site speed and mobile friendliness are considered ranking signals so this is an important feature, although some SEOs are slow to adopt it. Accelerated Mobile Pages lets you see all the pages on your site with AMP implemented and which ones have errors. If you click on the error, you can see a list of your URLs with errors. Then by clicking on the URL, you will be recommended a fix by Google. Search Analytics tells you how much traffic you get from search, revealing clicks and impressions delivered on SERPs. It will also work out your click-through rate (CTR) and reveal your average organic position for each page. And here’s the *really* good stuff… you can also see the queries that searchers are using in order to be served your site’s content. The data for this is collected differently from Google Analytics, so don’t expect it to tally, however what this feature is really useful for is seeing which keywords and phrases are driving traffic to your site, as well as individual traffic-generating pages. You can toggle between a variety of options, filters and date-ranges. I highly recommend looking at Impressions and CTR, to see which pages are generating high visibility but low click-through rate. Perhaps all these pages need is a tweak of a meta-description or some structured data? Here’s where you can see the domains that link to your site and its content the most, as well as your most linked webpages. This isn’t an exhaustive list, but a good indicator of where your content is appreciated enough to be linked. Clicking on the URLs on the right hand-side will show where they’re being linked to individually. Here is where you can see how often each page on your site has been internally linked. Clicking on each ‘Target page’ will show a list of URLs where the internal link occurs. There is a limit to how many ‘Target pages’ Search Console will show you, but if you have a small number of pages you can reverse the sort order and see which target pages have zero internal links. You can then go into your site and give these pages an internal link, or redirect them to somewhere else if they’re old legacy pages. This is where Google will inform you if it has administered a manual action to your site or specific webpage. Google will offer any recommendations for you to act upon here, and will give you the chance to resubmit your site for reconsideration after you’ve fixed any problems. Here’s a guide to what Google will most likely give you a manual penalty for and how you can avoid it. Here you can target an audience based on language and country. Country: If you have a neutral top-level domain (.com or .org), geotargeting helps Google determine how your site appears in search results, particularly for geographic queries. Just pick your chosen country from the drop-down menu. If you don’t want your site associated with any country, select ‘Unlisted’. Language: If you manage a website for users speaking a different language, you need to make sure that search results display the correct version of your pages. To do this, insert hreflang tags in your site’s HTML, as this is what Google uses to match a user’s language preference to the right version of your pages. Or alternatively you can use sitemaps to submit language and regional alternatives for your pages. As mobile has overtaken desktop for searches this year, obviously your site has to be mobile-friendly, otherwise you’re providing a poor user experience to potentially half your visitors. This report tells you of any issues your site has with mobile usability. And you’ll really want to be seeing the following message, as Google explicitly states you’ll otherwise be demoted. Flash usage: mobile browsers do not render Flash-based content, so don’t use it. Viewport not configured: visitors to your site use a variety of devices with differing screen sizes so your pages should specify a viewport using the meta viewport tag. Fixed-width viewport: viewports fixed to a pixel-size width will flag up errors. Responsive design should help solve this. Content not sized to viewport: if a user has to scroll horizontally to see words and images, this will come up as an error. Small font size: if your font size is too small to be legible and requires mobile users to ‘pinch to zoom’ this will need to be changed. Touch elements too close: tappable buttons that are too close together can be a nightmare for mobile visitors trying to navigate your site. Interstitial usage: Google will penalise you if you’re using a full-screen interstitial pop-up to advertise an app when a user visits your mobile site. This lets you know how many pages of your website are currently included in Google’s index. You can quickly see any worrying trends from the last year (for instance that little dip in May 2015), as well as any pages that have been blocked by robots or removed. Here you can see the most common keywords found by the Googlebots as they last crawled your site. If you click on each keyword, you’ll be able to see the other synonyms found for that keyword, as well as the number of occurrences. As Simon Heseltine suggests, look out for unexpected, unrelated keywords showing up as it’s an indication your site may have been hacked and hidden keywords have been injected into your pages. These are listed by host-name, then by specific pages, which you can follow steps to diagnose and resolve. Where essentially you can make your content disappear from Google. This only acts as a temporary fix, but by the time you’ve done this and either deleted your offending webpage or 301 redirected it elsewhere, there theoretically should no longer be a record of it. Just enter the URL then select whether you want it removed from the search results and the cache, just from the cache or if you want an entire directory removed. Be warned: this request can take between two to 12 hours to be processed. This report shows all the errors that Google has found when crawling your site over the last 90 days. Site errors: the top half of the screen shows three tabs, where if you click on each you can see any past problems with your DNS, your server connectivity or whether a crawl had to be postponed. (Google will postpone a crawl rather than risk crawling URLs you don’t want indexed). URL errors: the bottom half of the screen shows URL errors for desktop, smartphone and feature phone (a phone that can access the internet, but doesn’t have the advanced features of a smartphone). Server error: Google can’t access your site because the server is too slow to respond, or because your site is blocking Google. Soft 404: this occurs when your server returns a real page for a URL that doesn’t actually exist on your site. You should replace these pages with 404 (Not found) or a 410 (Gone) return codes. Not found: these are all your 404 pages that occur when a Googlebot attempts to visit a page that doesn’t exist (because you deleted it or renamed it without redirecting the old URL, etc.) Generally 404 pages are fine and won’t harm your rankings, so only pay attention to the ones related to high-ranking content. This section shows the progress of Googlebots crawling your site in the last 90 days. You can see how fast your pages are being crawled, kilobytes downloaded per day and average time spent downloading pages on your site. Spikes are perfectly normal, and there’s not very much you can do about them. But if you see a sustained drop in any of these charts then it might be worth investigating to see what’s dragging it down. Here you can check how any page on your website is seen by Google once its been been crawled. You can also submit these webpages for indexing. You may find this is a quicker way to be crawled and indexed then if you were to let Google find the page automatically. When you ‘Fetch’ a page, Google will simulate a crawl and you can quickly check any network connectivity problems or security issues with your site. ‘Fetch and Render’ does the same as the above, but it also lets you check how the page itself looks on mobile or desktop, including all resources on the page (such as images and scripts) and will let you know if any of these are blocked to Googlebots. Remember the crawler is meant to see the same page as the visitor would, so this is a good way to get a direct on-page comparison. If the page is successfully fetched and rendered, you can submit it to the index. You are allowed 500 webpage fetches per week, but you can only submit a webppage and have Google crawl ALL the pages linked within it, 10 times per month. A robots.txt file placed within the root of your site, is where you can specify pages you don’t want crawled by search engines. Typically this is used because you don’t want your server overwhelmed by Googlebots, particularly if you want them to ignore script or style files, or if you want certain images not to appear in Google Image Search. Here is where you can edit your robots.txt and check for errors. The bottom of the page reveals your errors and warnings. Sitemaps are hosted on the server of your website and they basically inform search engines of every page of your site, including any new ones added. It’s a good way to let Google better crawl and understand your website. Here’s where you can access all of the information about any sitemaps either submitted manually or found by Search Console. The blue bar represents pages or images submitted, the red bar represents actual pages and images indexed. You can test a sitemap by clicking the ‘Add/Test sitemap’ button, and if it’s valid you can then add it to Search Console. As Simon Heseltine has previously commented, this section isn’t used much anymore since the introduction of canonical tags. However you should use URL Parameters if, for instance, you need to tell Google to distinguish between pages targeted to different countries. These preferences can encourage Google to crawl a preferred version of your URL or prevent Google from crawling duplicate content on your site. Although any security issues will be communicated with you in the Messages section and on the Dashboard screen, here’s where you can check on problems in more detail. There’s also plenty of accessible information here about how to fix your site if it’s been hacked or been infected with malware. Here’s where you can access all the tools provided by Google, outside of Search Console. Including the Structured Data Testing Tool and Markup Helper, which we went into greater detail about in earlier sections. Other helpful resources here are the Google My Business Center, where you can use to improve your business’s local search visibility and the PageSpeed Insights tool, which will tell you exactly how well your site is performing on mobile and desktop in terms of loading time, and how to fix any issues. In previous ClickZChat sessions we’ve largely covered content and platforms, but seeing as it’s a Twitter event held by both ClickZ AND Search Engine Watch, it seemed only right that we spend some time looking at search in more depth. Question 1: What are the biggest challenges you face when optimizing for local search? Many people also felt that citations were a hassle for a variety of reasons. This issue is compounded when you consider the lack of SEO expertise on site. In many cases it simply isn’t considered an issue. Q2: What are the absolute essentials for a decent local SEO presence? Once you have your listings in order, there’s also a big case to be made for (you guessed it) content. While there’s no doubt that technical optimisation plays a huge part, it is worth remembering that with so many local searches taking place on mobile devices, user intent is the primary motivator. @sewatch @RobinHeed Simply concentrate on great customer service. SEO will come naturally as a bi-product of customer feedback/engagement. Q3: What one local SEO tip has proven the most successful for you? That’s it for this week. A huge thank you as always to everyone who took part. We’ll be holding another chat this Wednesday at 12 noon Eastern Time. For more on Local SEO, check out Graham Charlton’s handy list of 30 quick and easy SEO tips for small businesses. Free Web Audit - Let our software run over 300 simultaneous checks to get a clear picture of your competitive market.